That she already had that milestone marker in her mind made me think our bug safari partnership might be coming to an end, but, when I showed her the odd little black specks that had rained down on my car, she didn’t miss a beat: “Caterpillar poo,” she told me. “Here, I’ll show you.” She went directly to a nearby bush and tore open a miniature green taco made of leaves. “Caterpillars,” she pointed to the pale creatures who were writhing in the unexpected light. “And there’s their frass.” Like many properly reared children, she has a number of useful euphemisms in her vocabulary, including the correct one for insect excrement. As Olivia could tell you, not all frass is treated equally by the frassmakers. Some insects, like weevils and Japanese beetles, seem oblivious to theirs. They crawl around on it like frat boys on the beer cans and fast food wrappers of drunken evenings past. The much more fastidious cockroaches carry theirs away from their living quarters. 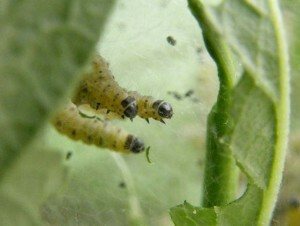 Tent caterpillars keep expanding their gauzy domiciles in order to escape the products of their common latrines. Thanks to a symbiotic bacteria in termite guts, theirs is so clean they can use it as building blocks. But my favorite form of disposal belongs to the honey bee. Bee babies do not sully their hives like human infants do. All the frass of a bee’s larval life accumulates in a blind gut and is discharged in one gigantic frassbomb on her first flight from the hive.